It is true that we each go through our days asking mini questions. Questions to ourselves, questions for others. Your goal for ASL is to become conversational. Well, that means you need to know how to ask all sorts of questions. Today, we’re going to cover the top 2 types of questions-- WH questions and Yes/No questions. Be sure to grab the FREE practice workbook underneath the video before you head out. Question = the wh-question word -or- the y/n question word. Here’s a list of the signs you’ll use when asking a WH-type question. Do you remember what your eyebrows are supposed to do? Furrow your eyebrows, as if you’re thinking [ thinking emoji ]. You’re also going to jut your chin out a bit. Nothing crazy!! For Y/N questions it’s whatever the question is and you add your y/n question eyebrows which are….. ? UP and tilt your head slightly forward. For instance: PARTY GO? SHOE LIKE? The question part of the sentence is the LAST word, and sometimes it may be the last 2 words, depending on the question and length of the sentence. Let’s take some English sentences and translate them into ASL. #1 Do you like fish? I’d sign: FISH LIKE? to keep it short and sweet. #2 Are you going to the library tomorrow? #3 Do you know where the museum is? #4 Why is that man staring at me? #5 Are you sure the party starts at 6:30? 6:30 NIGHT PARTY IT START? 6:30 NIGHT PARTY IT START TRUE-BIZ? The rule of thumb for questions is to keep it simple. You probably noticed that I didn’t use all the referents or even all the comments. Perhaps the question word was a bit different than what was listed. You want to drill down to what the real meaning is and sign that and let the rest fall to the side. You don’t need it. I’ve got a mini-workbook with questions for you to try this out yourself to really get a feel for how to do this. Remember if you work on the questions on paper and really start to feel comfortable with the concept, when you go to sign with Deaf folks, the questions will come to you naturally and you won’t have to worry that you’re doing it wrong. In upcoming videos we’ll be going over more types of ASL sentences! Make it a habit to sign questions (either in your mind or for real) when you hear a question being asked or when you ask a question. This is the #1 habit that helped me get from average signer to a professional signer today. CARPET AREA BABY POWDER POUR-OVER WHY!?!?!?!?!?!??!!!!! 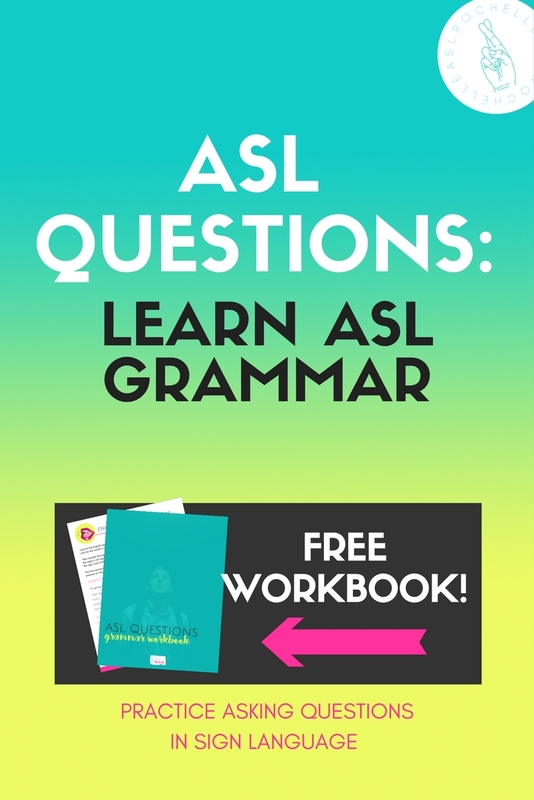 Question of the day: Do have any questions about signing ASL questions?? Ha!